It goes without saying that a yacht jobs are not without their difficulties. But a career as a superyacht chef may be one of the routes with the most amount of pressure in the yacht crew industry. Each and every dish that leaves the galley must look and taste absolutely perfect. There is no time for complacency, no room for slacking, and definitely no space for carelessness. Yacht chefs are expected to be innovators, experimentalists, and creators. They must remember preferences, allergies, and dislikes. There is no respite from the continual need for top quality service. Superyacht chefs must be versatile, dedicated, and calm. It is no surprise, then, that superyacht chefs often come with previous experience in luxury establishments on land – whether Michelin-starred restaurants or 5-star hotels. YPI CREW spoke to Michelle Bonetti, the Head Chef of M/Y MOSAIQUE, to find out more about the daily routine of a superyacht chef. Michelle did a 4-year chef apprenticeship in Perth, Australia, and cooked in different restaurants before getting her first yacht job. She was fortunate with the places in which she worked, gaining training with many famous, Michelin-starred chefs, including Feran Adria and Massimo Bottura. 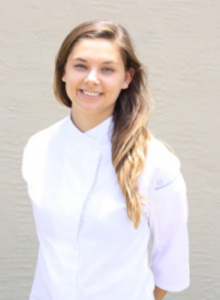 In order to stay on top of her game and develop new culinary skills, Michelle completes many courses and stagiaire programs during the winter season, as the yacht on which she works stays in the Mediterranean. In 2016, Michelle travelled to Bangkok to undertake a Thai cooking course, Tokyo to complete a sushi course, and Paris to do a boulangerie course. Later this year, she will fly to New York to work at Blue Hill – one of the best three Michelin-starred restaurants in the world. 6:00 am: First off, I turn on some music in the galley, make a cup of tea and then start work by setting up for the guests’ breakfast. I bake croissants, breakfast muffins, scones, fresh breads, juices, and fruit plates etc. A small spread is also made for the crew – some cut fruit, muffins and croissants to help them start their day in a good mood. 7:00 am: I write the guest menu for the day, which the chief stewardess will print for the guests to look at in the morning. I will then start preparing guest and crew lunch, while waiting for the guests to get up and order their a la carte breakfast. I will usually also prepare parts of the guest dinner menu in the morning, if I have time. 12:00 pm: Crew lunch is served, which usually consists of 5 dishes served as a buffet – 1 or 2 salads, a fish or seafood dish, a meat dish and a carbohydrate. Crew usually like to eat quite simple, healthy meals. 1:00 – 2:00 pm: The guests then decide at what time they would like to eat lunch. Fresh bread is prepared and usually a buffet, depending on the preferences of the charter guests. A light dessert then follows the buffet. All guests that come on-board are different; some choose the dishes they would like to eat, while others leave it up to me. 3:00 pm – 4:00 pm: In the afternoon, I take a break. Sometimes I manage to fit in a quick nap. 4:00 pm: I set up for the crew and guest dinners, finishing any preparations that I did not manage to get done in the morning. I also prepare some canapés. 6:00 pm: Crew dinner is served. 6:00 pm: Guest canapés are served. 8:00 pm: The guests decide at what time they would like dinner. Often, there will be a last minute change to the menu. Freshly baked bread and a three-course dinner, followed by homemade petit fours and sometimes cheese, are served. 10:00 pm: When the guests have finished eating, the galley is cleaned, sanitised and left for the morning, when everything will start again with a different menu. To find out more about yacht chef jobs and converting your land-based experience into career prospects, contact a member of the YPI CREW team.